The biggest NFL story of the past week is Washington head-coach-for-the-moment Mike Shanahan’s decision to bench healthy starter Robert Griffin III in favor of backup quarterback Kirk Cousins. The Redskins are in Atlanta to play the Falcons today at 1:00, and ALDLAND will be there. I am excited to take in my first NFL game since a few Lions games at the Silverdome in the early 1990s. Most Falcons fans are hoping their team will lose out so as to ensure a high draft pick (Jadaveon Clowney is their preference), but I’d like to experience a home victory. I also am looking forward to seeing MSU-grad Cousins in action. I don’t know whether some or any of Cousins, Griffin, or Shanahan will be in Washington next season, but Cousins has a big professional opportunity to make the case that he deserves to be an NFL starter next year. Stay tuned here and on twitter for updates from downtown Atlanta this afternoon. There’s still time to vote in ALDLAND’s week 1 college football poll. The week 2 poll will open soon. 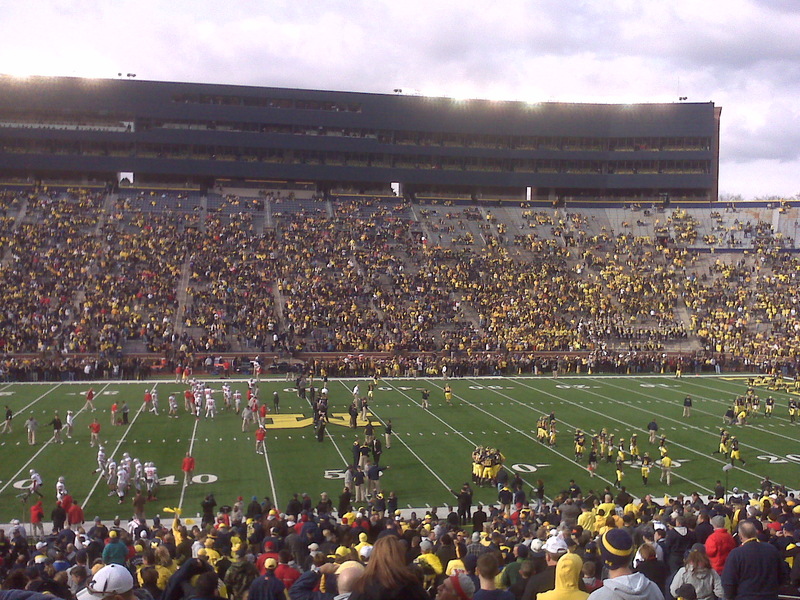 Brendan and Physguy were in Ann Arbor for ESPN College Gameday, and the only evidence is a couple cryptic tweets from Brendan. I was able to find Michigan State’s game against South Florida on television in the Southeast, which may be thanks to USF’s participation in the game, but which also felt like finding a unicorn in the wild. MSU’s defense continues to outscore their offense, and that’s with three quarterbacks! Even Sparta only ever had two kings at once. Michigan State 21, South Florida 6. I also found Vanderbilt-Austin Peay on TV, which is a reminder that it’s week two for the broadcasters as well. 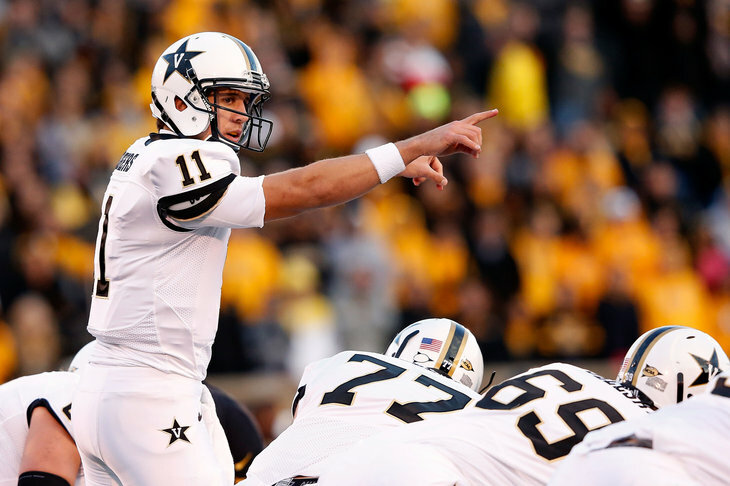 VU had no problem with its Middle Tennessee neighbors, winning 38-3. Yes, he’s only played one professional football game, and yes, the cases for his extraordinariness and ordinariness have been made and made and made, and yes, I’m a fan of his, but still, Robert Griffin III continues to impress. Often, we are able to view an athlete’s greatness directly. 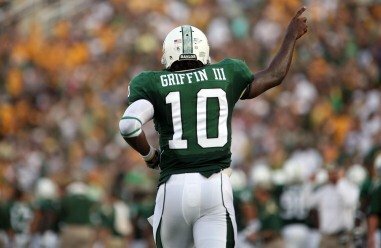 Such has been the case for Griffin, who previously played major-conference college football and now plays in the NFL. Other times, we are able to detect evidence of an athlete’s greatness indirectly. Those times may be tougher to identify, but they also may be more illuminating and demonstrative of greatness. If you just pulled your head out of your old pile of Sports Illustrated for Kids and haven’t really paid attention to the NFL over the last ten years, you might not realize that Griffin’s current head coach, Mike Shanahan, doesn’t really have a great reputation these days. In particular, he’s got a bad one for ruining quarterbacks. Just ask Donovan McNabb. That’s why one of the most amazing results of RG3’s stellar debut on Sunday has been the evaporation of anti-Shanahan sentiment in the media. Far from destroying the great potential Griffin represents, Shanahan installed a plan that is being called “brilliant” and “beaut[iful]” and a lot of other nice things around the web. Should things continue along the path Griffin started down on Sunday, the redemption of Mike Shanahan won’t be RG3’s greatest accomplishment, but it might be one of his most telling. At the very least, it will tell us what we knew all along: it’s the players who ultimately make the coach, not the other way around. 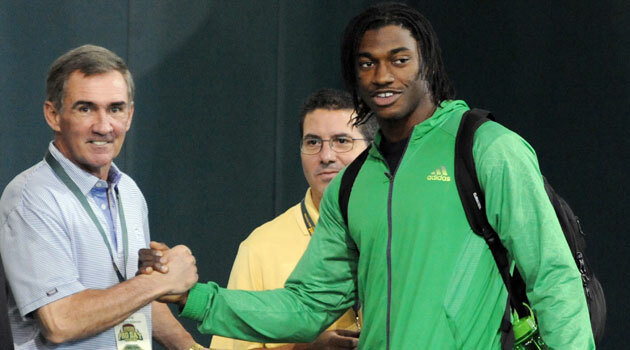 As hoped for here on this site, Robert Griffin III became Baylor University’s first Heisman Trophy winner on Saturday night. Griffin was the clear choice for the award, in my mind, and the voters agreed. No sooner had the Kentucky Wildcats become the top team in the basketball land then they went into Bloomington and fell to the unranked Hoosiers on a last-second three pointer. Unranked Michigan State went out west and beat a ranked Gonzaga team at their place, and unranked Murray State took down #20 Memphis on the road to go to 10-0 on the road. In the NFL, the Indianapolis Colts, Green Bay Packers, and Denver Tebows held serve this weekend, doing what they’ve been doing the way they’ve been doing it all year. Despite a defense stripped by injuries and a suspension, the Lions held on to go to 2-0 on the year against division foe Minnesota, a game Detroit had to have. In the nascent NBA, the nixed Chris Paul trade still is on hold despite early reports that the Hornets, Lakers, and Rockets had reworked the deal. As I write this, the latest from ESPN’s “sources” is that the Los Angeles Clippers have moved onto Paul’s shortlist of acceptable destinations behind the Lakers and New York Knickerbockers. The emerging offseason baseball story is NL MVP Ryan Braun’s positive PED test, but fans should be aware that Manny Ramirez, who I assumed was totally dunzo, may be back in baseball in the upcoming season. The sum total of these and other stories lead me to believe that December is mere prelude to 2012’s sportspocalypse.